If one of your New Year resolutions was to take a healthier approach to food, then starting the day with a delicious juice or smoothie is surely one of the easiest way to pack in a whole heap of goodies. For the last couple of weeks, this is what I’ve been doing and I feel fantastic. I’m gradually working my way through the Passion 4 Juice recipe book, created by my good friend Trish Tucker-May, which features some brilliant recipes for juices and smoothies made from both fruit and vegetables. “I feel really lucky as we leave the UK and head Down Under for the summer of festival fun. Spending six months in the UK and six months in Australia, keeping people healthy at festivals, is an unusual but rewarding way to live my passion. But it seems right to me as I get to go home and see family and friends. Also escaping the UK winter has its benefits! “Why not kick-start each day with a taste sensation that will revitalise, inspire and rejuvenate you? With our on-the-move lifestyles and chaotic schedules, it is difficult to find the time to prepare and consume a meal that has sufficient energy and nutrients to sustain a balanced and healthy way of life. Quick and wholesome refreshments, rich in vital nutrients, are in high demand. This is the kind of daily boost we need. “If it’s a tangy wake-up call, a smooth pacifier or a zesty jump-start you’re after, your personalised fresh pressed juice will do the trick. As I mentioned, I’m enjoying working my way through the Passion 4 Juice book. My favourite juice concoctions so far have been The Morning After featuring ginger, carrots and pineapple and Buzz Juice with apples, celery and beetroot. 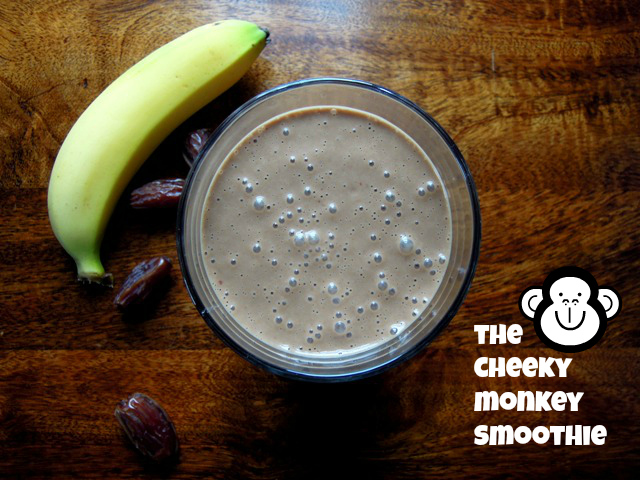 And the whole family loved this gorgeous smoothie recipe from Trish called The Cheeky Monkey, made with almond milk, banana, raw cacao, dates and spices. We served ours cold over ice, but Trish recommends this served warm as a lovely winter warmer. We also left out the chilli from the children’s helping. Blend all the ingredients in a liquidiser, and then warm in a pan on the stove top – don’t overheat but give it just a bit of warmth so it stays raw and delicious. This should warm you up on the coldest of winter days. All you have to do to win one of eight Passion 4 Juice recipe books is leave me a comment below, providing your ideas for new smoothie or fresh juice combinations. Trish will select her eight favourites to receive a prize. The closing date for entries is Sunday 2 February 2014 and please note that books can only be shipped to UK addresses. I can’t wait to hear your suggestions! But is juice the new junk food? Fruit juice is getting some bad press at the moment. Is fruit juice the new junk food? I absolutely agree with Emine Saner and Elizabeth Chaplin in the story reported in the Guardian http://www.theguardian.com/lifeandstyle/2014/jan/17/how-fruit-juice-health-food-junk-food?CMP=twt_fd. Fruit boxes should be consumed with caution. Concentrated, heat treated fruit juice is packed with sugar and very little nutrients as with heat treating most of the goodness is destroyed. But if you are having fresh pressed juice or smoothies packed with real fruit and veg I can guarantee you are going to be feeling more energised and your immune system will thank you. I like to eat my fruit and drink my veg. With the exception of bananas which are a must for making green smoothies packed with kale more palatable. Fruit sugar is very different to refined sugar and shouldnt be feared. I think it also depends on where you live and what is in season. I am in Australia at the moment and it is mango for breakfast, lunch and dinner. They are ripe, local and packed with the suns energy. I don’t tend to make smoothies with them as I find it too sweet and too much fruit in juice or smoothies gives me a sugar headache. The trouble we often face is that our kids are having a juice box instead of water. They would be better off eating an apple and drinking water. The juice box, even though it may say ‘no added sugar’, still acts as sugar when entering the blood stream . It is nutrient poor due to the processing and heat treating. I think it is important to differentiate between processed smoothies and ones you make yourself and drink fresh. Smoothies made at home with raw, seasonal fruit are easily digested and very good for you. But if you were just juicing lots of fruit you may still be feeding infections, candida and even cancer as these thrive on sugar. Be aware of fast food giants selling smoothies that are 100% real, natural and with a ‘real fruit feel in the mouth’. This is processing gone nuts. They will have no nutritional value, be high in fat and packed with sugar. If it is heat treated (killed/concentrated) it will have no living enzymes. Now that Innocent Smoothies have been bought out by Coca-Cola I bet they are going to have more sugar than ever. My advice will stay the same. Eat your fruit, drink your veg and try getting more leafy greens into you anyway you can. If it is in a smoothie, great! It has been working for me for the last 30 years. Don’t forget that 4 – 6 pints of pure filtered water is also vital to good health and abundant energy. What do you readers think about juice being junk? I know how I feel if I have junk food and I know how I feel when I have a real, fresh, raw smoothie like the Cheeky Monkey for an afternoon pick me up. As a mum I also know what I feel comfortable giving my kids. Give me the home made smoothie anyday! My absolutely favourite summer drink is strawberry slush with 7up (for 2): 10 frozen strawberries, 2-3 sliced bananas and 1 can of 7up. 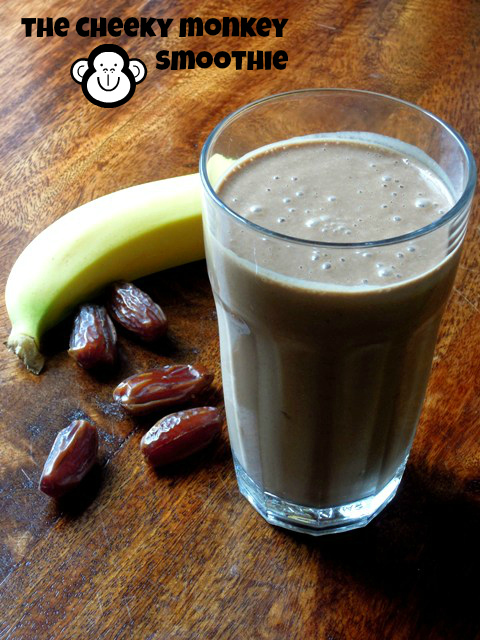 Winter one is: 5 dates, 1 banana, 100 ml of almond milk, 1 tsp of hot chocolate powder. Ooh lovely! Look forward to summer to try your strawberry slush. Perhaps I could use fizzy water to lower the sugar content? Yes it sounds really good but with too much sugar for me – I like the idea of sparkling mineral water instead. yum, very refreshing! I’ve never thought of adding fenugreek leaves to a smoothie – definitely giving that a go asap! This sounds really interesting. I love adding herbs and spices – so beneficial and delicious. my usaul breakfast is smoothies of all combo’s . This was my latest and loved it . This is so stomach filling and tasty . I have run out of kale and spinach in the garden now so have decided to try choko leaves – not bad! I have juiced stinging nettles before but never in a smoothie. I will try when I get back to the UK in May. We don’t have them here in Australia. I don’t know choko leaves, am I missing out on much? Janie did you have to soak the nettles first ? or just used fresh picked ? thankyou ! Nope, I just used freshly picked ones! Do let me know how you get on with it! Having just made a banana, avocado and chocolate pudding, I KNOW this would be a great combination for a smoothie too – yum! Spinach and peach. Or maybe avocado and almonds is a smoothie I am currently thinking of working on. Oh yes, I saw spinach and peach on your blog – looked gorgeous. Let me know how the avocado and almonds combo works out! oooh peach, now there is an inspiring idea. Must try this one. Yum feeling a bit coldy and grumpy (day off tomorrow after a 14 day week) and husbandless so I tried this smoothie with cashew butter and it’s yummy I feel more cheerful already. I like beetroot, apple and fennel (and sometimes add fennel seeds if I haven’t got left over bits of bulb fennel. I’m keen to try green juices – the nettle one above makes me think I’ll have to try that too. I am eager to get over my reluctance and try fennel .. I just keep thinking I will taste a glass full of licorice root for some reason ?! Spirulina & banana – it’s a kiwi favourite, and much nicer than it sounds! ooh yes I love it too, also with pineapple and a bit of yoghurt. My favourite smoothie is anything with spinach in it. It keeps me a proper boost in the morning. Me too, I love spinach, kale, apple, cucumber and banana. I like it with coconut water as the liquid. Divine! These are all lovely recipes, it will be hard to choose my favourites. Keep them coming and please keep sharing with friends and family. My mission is to inspire people to be healthy by making juice and smoothies everyday. I quite like – for winter – a Chai spiced one. I made one with almond milk, banana, cinnamon, cardamom, vanilla and ginger. If feeling indulgent a bit of vanilla ice cream…! my favorite smoothie is seasonal fruits, Greek yogurt , oats , almond and protein powder. you are good to go till lunch, sometimes don’t even need lunch, just a light snack. This sounds great. I have been using good hemp seeds and oil as protein. Also making my own almond milk is saving me lots of money. Many more recipes on my FB page too passion4juice so please check it out.